United States Chargé d’Affaires David J. Kostelancik thanked the many guests from non-governmental organisations and civil society organisations who attended the US Independence Day Celebration at the Residence in Buda on July 3. Kostelancik said these organisations were inspirational in a wide range of fields, from combatting human trafficking to organising the imminent Budapest Pride March to enhancing transparency in governance and improving access to services for disadvantaged populations. 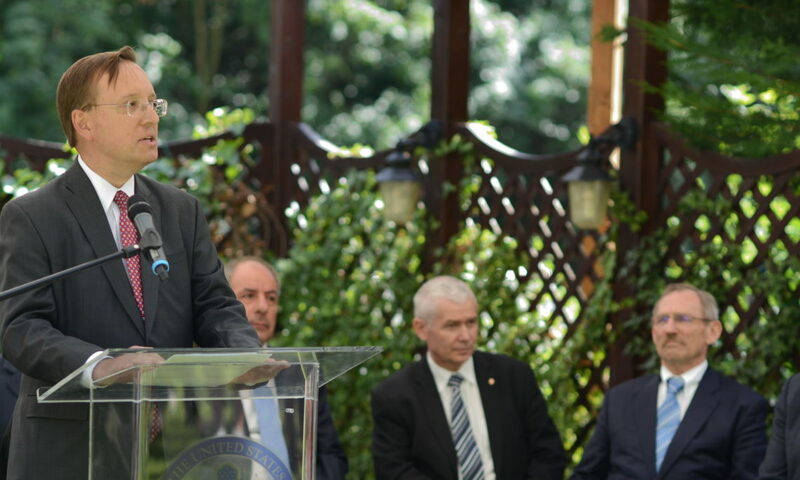 Kostelancik was addressing up to 1000 guests, including four Hungarian officials sitting alongside him: President of the Constitutional Court Tamás Sulyok, Chief Prosecutor Péter Polt, Minister of the Interior Sándor Pintér and Deputy Minister of Foreign Affairs and Trade István Szabó. Possibly, and although it went unsaid on this celebratory day, his remarks may have caused some guests to think of the series of governmental attacks against Hungarian NGOs as part of its process to establish an “illiberal state”. Kostelancik spoke of the “robust, broad and deep relationship with Hungary that stretches back to the very earliest days of our Republic, when Hungarian officers were instrumental in building up and training the Continental Army of former shopkeepers and farmers. He said America is the second-leading investor in Hungary after the EU. American companies had created almost 100,000 jobs in Hungary, and many were looking for new opportunities to invest and establish the sort of good paying jobs that would keep young, talented Hungarians in their home country. The Hungarian Defence Forces this year had hosted thousands of US troops for multinational exercises, including many exercises going on this month across the country and the Black Sea region.